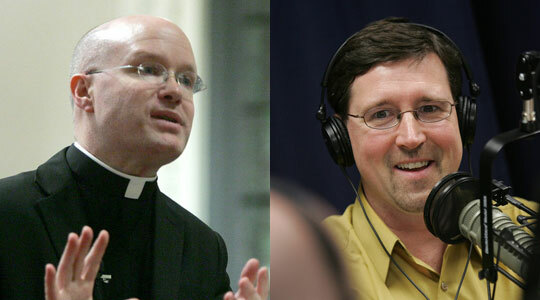 Summary of today’s show: Gregory Tracy and Fr. Roger Landry join Scot to discuss the news of the week, including Houston’s Cardinal DiNardo’s statement on the proposed religious exemption from a federal contraception mandate; Archbishop Gomez’s remarks on the contributions of Catholic immigrants to the US; the four new initiatives of the Knights of Columbus, including the purchase of the John Paul II Cultural Center; and Fr. Roger’s editorial on euthanasia. 1st segment: Scot welcomed Fr. Roger and Greg back to the show. Susan is off this week. Scot said today is an important day in the Church’s calendar for priests because it is St. John Vianney’s priest. He asked why the Church has singled out this one priest to be the patron saint of priest. Fr. Roger said he showed proper priestly priorities. When he went to Ars, France, it was dead spiritually and he prayed daily in his church for 10 years asking God to convert his people and spent 18 hours per day in the confessional. There was a lot of sin in his town when he arrived, but at the end people who came to Ars were amazed at the holiness of the people of Ars. He was not a gifted man in human measurement. He was kicked out of seminary three times for his academic deficiencies, but he shows that you don’t have to be as smart as Pope John Paul to be a good priest. Greg said St. John Vianney really came into his consciousness when his relic came to Boston. It was available for veneration and he saw many people come to visit with him during the Year of the Priest. He was a man of deep, fundamental faith, not necessarily learned or a scholar, but truly one who has inspired millions through his humble Christian life. Scot said he’s like Tom Brady, nobody’s first pick, but on his way to the Hall of Fame. Scot asked everyone to pray for all priests today. 2nd segment: Scot said earlier this week, the Department of Health and human Services proposed a religious exemption for the mandate on all new health insurance plans to include coverage of contraception. Cardinal Daniel DiNardo of Houston said this exemption is way too narrow. For example, Catholic Charities would have to only employ Catholics and stop serving non-Catholics. Greg said this follows up recent coverage on this issue. As part of the new federal health mandate, “preventative” care must be provided free of charge and contraception is considered preventative care. Planned Parenthood has said there is an “epidemic” of unplanned pregnancy, but pregnancy is not a disease. This would not include Catholic schools, hospitals, and social service agencies. While HHS said the language is taken from existing state regulations, many state regulations simply don’t cover health insurance plans provided by religious employers. Federal law does not provide the same exemption. Scot said the cardinal said Catholics aren’t alone in objecting to these mandates. Scot said one of his biggest concerns about the Obama universal healthcare plan was how sweeping the changes to health care would be. Fr. Roger said a big concern here is that it says that taxpayers need to pay for abortifacient pills, even before we talk about religious exemptions and conscientious objection. He said for a long time the strategy of the Church was too lax because it sought just exemptions for the Church rather than saying that the principle itself of violating the consciences of all Americans by forcing them to pay for abortifacients, contraceptives, and sterilization. They’re forcing their immorality on all Americans. Are we going to stand up and say enough is enough. 3rd segment: Scot said the Anchor this week has an article called “When children are immigrants” about a recent forum in the Fall River diocese to discuss the support of children who are immigrants, especially those born to undocumented parents. Fr. Roger said the issue of immigration policy is shown in relief when we look at how we treat the kids. He recalled an immigration raid in New Bedford a few years ago in which parents were rounded up and sent off to Texas while the kids were still in school. When first- and second-graders returned home, their parents and cousins and aunts and uncles were nowhere to be found and it was up to the Catholic churches to find and take care of these kids. Often these kids are exploited in the underground system they find themselves and they are denied full legal representation and advocacy in our government system. Scot said immigrants are too often dehumanized by those opposed to some kinds of immigration, especially when their own parents were themselves immigrants. Archbishop Jose Gomez of Los Angeles is himself an immigrant from Mexico and recently spoke on immigration. Greg said the archbishop was speaking on the important role of Hispanic immigrants in the nation. He said we have a too-New England-centric view, but “long before the Boston Tea Party, Catholic missionaries were naming this countries rivers, mountains, and lakes for Catholic saints.” Catholics were here for many decades before the first immigrants on the Eastern seaboard. While the New England-focused American history tells the story of “great men” like George Washington, Thomas Jefferson and James Madison and also of “great documents” like the Declaration of Independence and the Bill of Rights, it is not the entire story. Fr. Roger said Gomez has seen this firsthand and now presides over a church with more than 5 million immigrants. He is thrilled that the archbishop has become a spokesman for the entire Church on immigration and becoming a voice for the voiceless on this issue. He agrees that the notion of our history is too New England-centric. But America is changing because of globalization, threats from abroad, and internal cultural forces. Greg said it is true that there is a creeping secularism in America’s elites and it is significant to him that these immigrants are coming here with a strong faith. Those most active in our Church with growing families are Hispanic. He noted that Europe is also experiencing massive immigration, but these communities are not integrating into society and hold values different from the historical values of Europe. In the United States, immigrants from Central America want to become part of our society and hold the same Christian values. Fr. Roger said the HHS mandate is a clear example of the elite openly hostile to religious faith. They do not want to accord us a right to say this is wrong. He noted that the US State Department has re-defined the right to religious belief to the right to worship; i.e. the right to attend a church, not a right to live out our faith the rest of the week. He said Archbishop Gomez speaks not just to immigration, but also the xenophobia of those who don’t want those with a great religious faith to come in and renew our country. 4th segment: Scot said the Knights of COlumbus are having their annual meeting in Denver this week. They have 1.8 million members and donated more than $150 million to Catholic causes and more than 70 million volunteer hours. The Knights also give a lot of support to the Vatican. they announced four new initiatives this year. The first is a disaster-response fund to help local councils become second-responders in providing food, clothing, and shelter in response to disasters. They are are setting up an outreach for children in Africa. The third is supporting vocations and Catholic chaplaincy in the military. And fourth the Knights are purchasing the John Paul II Cultural Center in Washington and expanding it to encompass the whole 500year history of Catholic culture in North America. Fr. Roger said Cardinal Adam Maida, the former archbishop of Detroit, was the leader in getting this started back in the 90s. It is a first-rate museum, but suffered from low attendance. Fr. Roger think the Knights will draw far more people there. He’s very excited that there’s a resolution for the center. The Archdiocese of Detroit has been trying to find a buyer for several years. A women’s religious order in Michigan had tried to buy it, but that fell through. He said Catholics need a museum in the City of Museums. Greg said it’s the Knights coming to the rescue once again. They have such a love for the Church and that’s why the Church goes to them when there’s a special need. The Knights have provided such critical support to the Archdiocese of Boston in the recent past. Greg admits he’s walked by the JP2 Center many times, often because he’s in town on other business and never seemed to make it inside. With the extra visibility that the Knights bring to it, especially if they make it a centerpiece of other activity there, it will draw much larger crowds. Scot said when Supreme Knight Carl Anderson was on The Good Catholic Life back in April he was much more excited about the time the Knights gave in volunteerism than the money they give. Scot said he’s especially happy about the second-responder program. Fr. Roger launched a Knights of Columbus council in his parish a few years ago. He said it forms men into strong men of the Church and of their families. It calls them clearly to live up to chivalrous heroism. The Knights have four pillars, one of which is service of community. In north New Bedford, they’ve been very active in the community especially for disabled and deceased veterans, programs for youth, Marian pilgrimages, pro-life activity in and around New Bedford including supporting crisis pregnancy centers. The Knights overall are getting stronger in both numbers but also the quality of the men and organization. Scot said the Knights of Columbus annual gathering is important in the life of the Church, especially since so many bishops from around the US gather to express their gratitude for all the Knights do, including Cardinal Seán and Bishop Hennessey. Some of the addresses given at the meeting are available at CatholicTV, which has been covering it live. 5th segment: Scot wanted to follow up that the reason the Knights can give so much to Catholic causes is because they provide life insurance to Catholics and because so many men join. Fr. Roger said in June the US bishops had a pastoral letter on living each day with dignity and he had not had a chance to work closely with that letter to explain it. Also Dr. Jack Kevorkian died in early June which focused attention again on the idea that killing those with terminal illness is compassionate. The bishops said that there is a movement to pass laws in certain places where they think it will be easier to set a precedent for killing people with terminal illnesses and other debilitating and chronic diseases. Economic arguments about health care costs are often cited. The US bishops are ahead of the curve. There are only two states in the US that have passed referenda allowing assisted suicide, but there is a growing movement to push the ides of “dying with dignity” through euthanasia. Greg notes that in Europe this issue has progressed much further than here, even to the point where the decision to kill the victim has been undertaken by others, including doctors and family members. Fr. Roger noted also in the Anchor this week that the Fall River diocese had a pro-life boot camp. The last abortion clinic in the diocese is in Attleboro and they’re working to put them out of business. The boot camp gathered about 35 young people to teach them how to be advocates for life and then be witnesses themselves, including praying outside the abortion clinic. Greg pointed a story about Bishop Elias Chacour from Haifa, Israel, visiting Boston recently and being interviewed by the Pilot about the state of Christians in the Holy Land. Scot pointed out a story about the parishioners of St. Evangelist in East Bridgewater reaching out to youth.